Two kinds of Clapper Rails occur in California. Both are endangered by extinction. It all began with hunters taking too many in the 1800's. But a law was passed making it illegal and the Clapper Rail began to recover. But within a few years, real estate developers began draining marshes of their water. Oil companies also drained the wetlands of their water by using levees so that oil wells could be place right in the wetland itself. The newest threat to the Clapper Rail is the Red Fox of the eastern US that have been turned loose in California wetlands by the Fur Industry. I could go on and on, but my objective here is to use the writings of early birdwatchers and scientists tell you in thier own words. The writings of these authors quoted here cover a time span of over 100 years. These writing will prove to you that Clapper Rails occurred in Ballona Wetlands and that the reason they were eliminated was because of hunters, real-estate developers, oil companies, and the fur industry. "CALIFORNIA CLAPPER RAIL. Tolerably common resident in the salt marshes along the coast. Among the lagoons between San Pedro and Long Beach, their loud cackling notes are frequently heard, especially at high tide, when they are driven to the higher ground. They probably nest in moderate abundance, though few eggs have so far been taken. W.B. Judson took a set of six slightly incubated eggs at Ballona, May 16, 1894.". This quote by Joseph Grinnell was from his 52 page monograph entitled: BIRDS OF THE PACIFIC SLOPE OF LOS ANGELES COUNTY, published by the PASADENA ACADEMY OF SCIENCES. At the time of his writing, the Los Angeles River sometimes flowed to the sea at Ballona instead of Long Beach. Joseph Grinnell, in 1898 was an instructor at the Throop Institute in Padasdena. Joseph Grinnell went on to get a PHD in Biology from Stanford University, and then become the illustrious and famous professor and director of the Museum of Vertebrate Zoology at the University of California at Berkeley. Joseph Grinnell was also a member of the newly founded Sierra Club and wrote articles for the Sierra Magazine. At the time that Joseph Grinnell wrote his Clapper Rail quote, the Sierra Club was six years old. This species, originally described from specimens taken at Newport, Orange County, is a common resident on salt and brackish marshes near the coast, but becoming scarcer every year. At extreme high tides it swims on the water after the fashion of the Coot, and as it is easily approached, it is killed in large numbers by the hunters. In many marshes where it was formerly common it has been practically exterminated. Eggs are generally deposited in April and early May." "LIGHT-FOOTED RAIL. There is no such conspicuous difference between this species and the northern bird as is indicated by the name levipes, although the feet of the females do average slightly smaller than those of obsoletus. Levipes is just as surely a 'Clapper' Rail, and this fact should be recognized in nomenclature. Inasmuch as this species was described from a beach near Los Angeles, and inasmuch as Los Angeles is entitled by divine edict (which no one hitherto has presumed to question) to everything in sight, I respectfully propose for this nimble-footed creature the name Los Angeles Clapper Rail. The San Francisco Clapper Rail is manifestly obsoletus, but the Los Angeles Clapper Rail, if not strictly levipes, is at least levicor, as becomes a true-hearted son of the South. Whatever might be the size, or weight of our Clapper Rail's feet after a bath, they sustain an empathetic increase whenever the bird essays to wade into the muck. Mucking is the serious business of life, but the Rails react to it as variously as people might. The first bird I ever saw, at Sandyland, was a sorry-looking slattern at best. She had been dabbling as well as wading, and while her feet were several sizes too large for her, as might be expected, her face was completely masked in muck, a veritable Dolores of the Swamps. It is only toward evening that the Los Angeles Clapper Rail becomes most active. As the sun sets, if the season is right, one may see an anxious mother stealing forth from the edge of the protecting salicornia and leading a little company, six or eight, of tottering youngsters all tricked out in costumes of shining black. Baby rails are ineffably cute. Whether it be the mother instinct or the bear instinct in us, we cannot tell, but I never meet one of these engaging waifs of the swamp without wanting to squeeze it, real hard. Eventide, also, is the time for that discursive song which won for our hero the name 'Clapper.' In a populous marsh one may hear six or seven birds at once uttering these peculiar, strident, iterative calls. The notes are very hard to characterize. Some one, I suppose, must have likened them to the sound of fence-board struck by a stick. To me they sound more the cheep of a baby Blackbird greatly exaggerated. With head and neck stretched vertically, the bird delights to roll out ten or a dozen of these notes in a series, rallentando sostentuto or rallentando et diminuendo, as the case may be. There is, I suppose, no bird more surely doomed to disappear before the inroads of civilization than this humble resident of our coastal marshes. A mere stretch of level land, unoccupied, is an abomination to a Los Angeles real estate agent. He will have it diked and drained and he will cover it with summer hotels, or billboards at the very least. And now that the coastal highway system has been completed, there is not a two by four patch of marsh land which is not ransacked by guns and dogs or small boys a dozen times a year. C'est le guerre. Que voulez vous?" "LIGHT-FOOTED RAIL. Resident on salt marshes from Santa Barbara at least to San Diego. Formerly common in all coastal marshes, but now, because of drainage of some marshes and pollution of others by oil, much more restricted in distribution. At extremely high tide swims on water after the fashion of Coot and, being easily approached, was formerly killed in large numbers by hunters." "LIGHT-FOOTED RAIL. Resident of the salt marsh, breeding there in April and early May. Adult male taken at Playa del Rey, August 29, 1933, by Mrs. A.V. Dedrick." 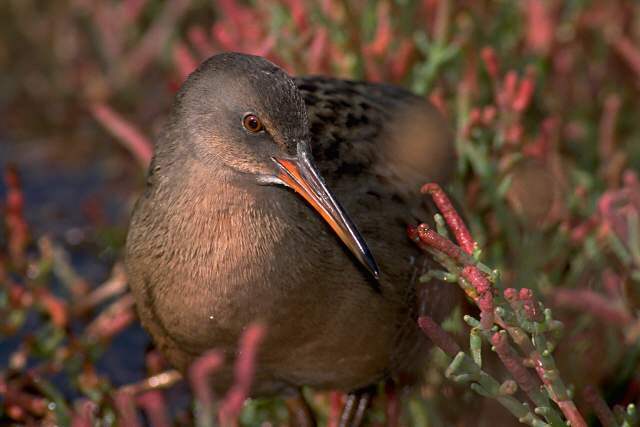 "Coastal birds, representing Light-footed Clapper Rail except as noted, are now primarily confined to the Seal Beach Marshes and Upper Newport Bay ORA, and the Tijuana River Estuary SD. Samller populations exist at Mission Bay and the south end of San Diego Bay SD, and Sandyland Slough, Carpenteria SBA. At Morro Bay SLO a small population may still exist, but there are no recent records. A population may persist at Point Mugu VEN, but there is only one published report there since 1972 (12 Jan 1980). One at Goleta SBA 6 Sep 1969 suggests that some movement may occur in the coastal races, s the resident population at Goleta had been extirpated by that time. There are no records from the Channel Islands. Along the coast the Clapper Rail has declined drastically in recent decades because of the destruction of salt marsh habitat (especially favored by the rails are large large estuaries dominated by Salicornia and Spartina). The coastal races are considered endangered. The species has been extirpated from Los Angeles County (recorded to at least 1949 at Playa del Rey) and perhaps from Ventura and San Luis Obispo Counties, and has been substantially reduced in all other areas. A recent census of coatal southern California marshes yielded only 203 pairs." This quote by Kimball Garrett and Jon Dunn was taken from their comprehensive book entitled: Birds of Southern California, Status and Distribution, Los Angeles Audubon Society, Los Angeles California. You should note that the abbreviations are their own code words for counties. As you read that account, you should have noted SD, VEN, SLO, SBA, and ORA. These are the abbreviations of all the counties from central California to the Mexican border, but excluding Los Angeles County. It is painfully obvious that every coastal county of southern California has managed to keep the Clapper Rail from going extinct, except, you guessed it, Los Angeles County. Shame on Los Angeles County and by association Los Angeles City. The blame falls on the current mayor Richard Riorden, Supervisor Don Knabe, and councilwoman Ruth Galanter, for refusing to open the "tidal flap gates" on Ballona Creek. The irony of the writing of Kimball Garrett and John Dunn is quite interesting. For example, the book was published by Los Angeles Audubon Society, yet the entire text shows us that Clapper Rail do not occur in Los Angeles anymore. Secondly, Kimball Garret, a foremost birder of Los Angeles, is also the Ornithology curator of the Los Angeles County Museum of Natural History. His salary is paid by the County of Los Angeles and no Clapper Rails are in Los Angeles County. Furthermore, the Los Angeles County Public Works is primarily responsible for removing the Clapper Rail from Los Angeles County. The County Public Works Agency is also preventing Clapper Rail from re-establishing in the Ballona Wetland by not letting tidal flow return through the County "flap gates" on Ballona Creek. The County continues to dry out the wetlands, cooperating with Playa Capital/Dreamworks. If tidal flow were resored "now," right now, the wetlands of Salicornia (Pickleplant) would expand to Lincoln Boulevard immediately. And it is certain that the Clapper Rail would return. Of course, as an endangered species, the Rail would stop the development of Playa Capital/Dreamworks. So it is my belief that Los Angeles County Department of Public Works is in a conspiracy with the private developer called Playa Capital/Dreamworks. The same Los Angeles County pays Kimball Garrett salary who knows about the Clapper Rail but also pays the salarly of the Director of Los Angeles County Public Works. Lastly, Garrett and Dunn tell us in their quote, that coastal movement of Clapper Rails occurs. So if we created better habitat through restoration of tidal flow into Ballona, Clapper Rails from Orange County would fly back into Ballona and establish a resident population again. It would also be possible to bring young Clapper Rail from Orange County back to Los Angeles County. However, the developers of Playa Capital and Steven Spielberg of Dreamworks would be opposed to this, at least until their massive development would be completed. However, once completed there would no longer be any chance of establishing a population as the wetlands would be too small. Movie studios, homes, businesses roads, parking lots, and other supporting developments would have usurped any Clapper Rail potential at a viable population. The remaining wetlands would be too small to have a viable population of Clapper Rail.